Stop what your doing interiors addicts and listen up, I have discovered something that’s not only super fun, and super creative but has the added benefit of toning your arms while you do it, I know - thank me later. So last Saturday I joined The chunky Needle for an afternoon workshop learning to arm knit, I took my lovely bestie Angie Best with me as her Christmas present, she is a fantastic knitter and I thought this is something she would love- I was not wrong, actually it was a bloody good job I took her with me, there were some scary moments when without her help I could well have required a very sharp pair of scissors to free me!!!! I can almost sense the look of confusion on all your faces at the mention of Arm Knitting so for clarification Arm Knitting is the fabulous technique of knitting with your arms without the use of needles. 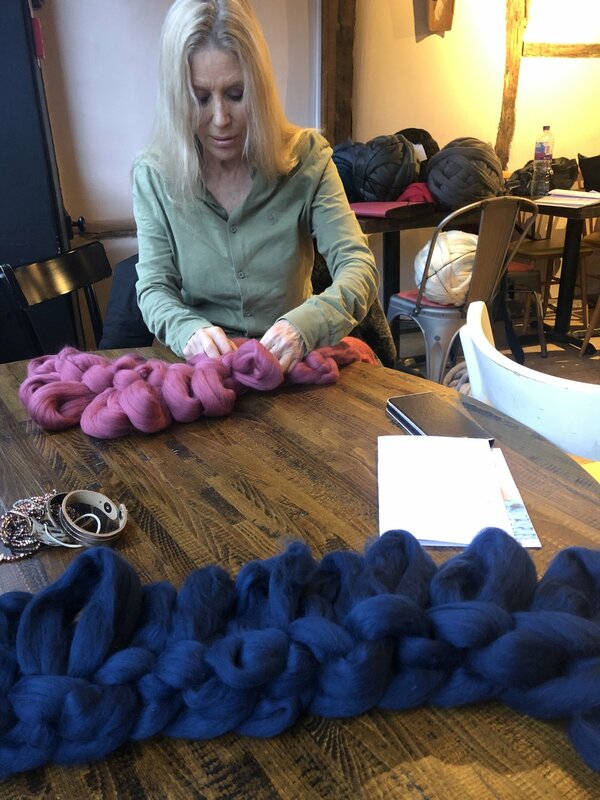 Simply, cast the first stitch onto one forearm, then use your hands to work through the stitches by pulling the working yarn through the loop to create a stitch. Jokes aside it was actually quite easy to get the hang of once you had mastered the casting on and I found that once I got in the rhythm there was no stopping me. Especially under the careful instruction of Courtney from The Chunky Needle who was an expert teacher with bags of patience. 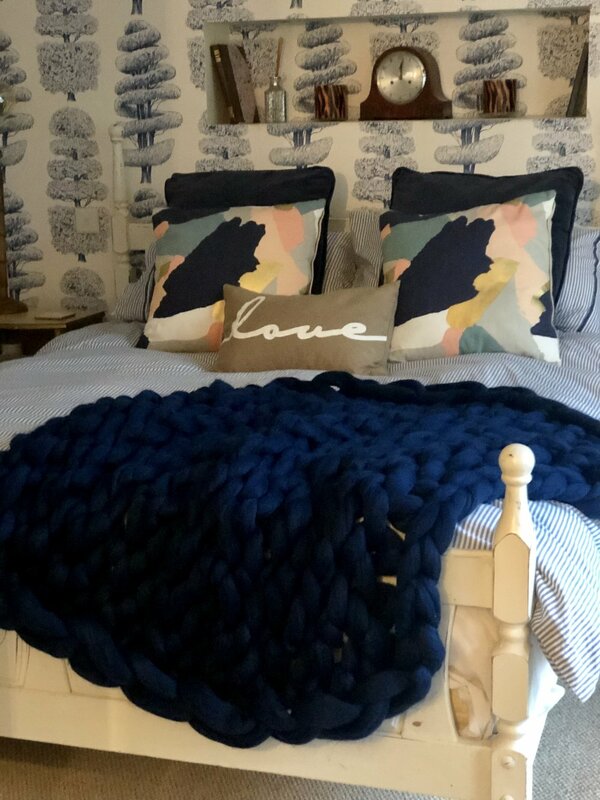 You can choose from either acrylic or merino wool and there is just about every colour under the sun to choose from so its easy to be able to make the perfect blanket for your interior scheme., I went for Ocean which is a lovely colour blue , perfect for me a Save the Ocean Campaigner! 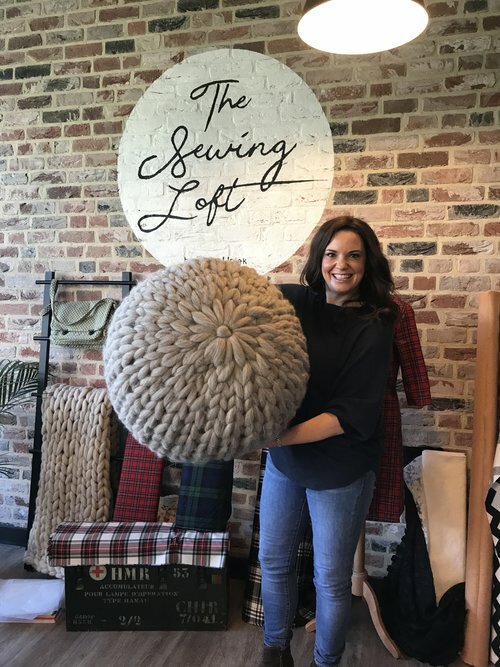 The chunky knit throw is a really popular interior look right now and they can often be very expensive in the shops but by going on a workshop you can make one for a fraction of the price and learn how to do it at the same time, Courtney will be heading back to Henley and joining Love Nellie HQ for the day very soon make sure you sign up to my newsletter to receive info of how how you can come along and join us’ maybe even to teach us all how to make one of these amazing pouffes. Thank you so much Courtney for a fun afternoon, its always great to learn new things, who knew in just a few hours we would be able to create something so fantastic. Banish those bingo wings folks get arm knitting! !